Don't miss a chance to have some extreme fun in your car, all whilst learning valuable car handling skills that could save your life, or anothers. Expert or novice, all are welcome! Help and instruction will be available on the day for anyone interested in pushing their skills just that little bit more. ;-) It's always a complete mix of skill levels so don't feel like you will be the only learner! 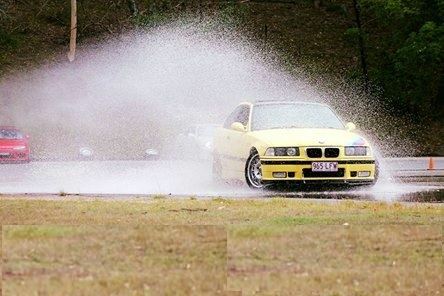 The cost is just $125 per entry for BMWCQ Members and only $140 per entry for non-members. Yes - you can share an entry with as many drivers as you want! Mt. Cotton Training Centre has a strict noise policy that applies to all Vehicles. Peek noise cannot exceed 90 dB. Random testing is performed by centre management (And BCC) and cars exceeding 90 dB will be banned from further use immediately. In this event, Safe Drive Training cannot provide any refund of course fees. Noise reduction advice is available for all cars. We recommend comfortable clothing with regards to the likely conditions (hat & sun screen or warm jacket & umbrella). We have a limited number of places for this events so register now - don't miss out!